Robin Limon has been a Department leader in numerous high-profile positions and brings a diverse leadership background to her new position. Limon graduated from the academy in 1989 and began her career at Sybil Brand Institute as a line deputy before transferring to Transportation Bureau. She worked patrol at Norwalk Station (NWK) as a field training officer and was selected to be a detective at Major Crimes Bureau. As a sergeant, Limon worked in multiple custody facilities before transferring to Pico Rivera Station (PRV) as a field sergeant and watch sergeant. She served at Emergency Operations Bureau in the Tactical Planning Unit before promoting to lieutenant. Limon’s experience as a lieutenant ranged from custody to courts before she returned to patrol at NWK as a watch commander and service area lieutenant. In December, 2018, Sheriff Alex Villanueva promoted Limon to the rank of Chief, overseeing Court Services Division. Limon has received numerous awards and commendations throughout her career for her dedication to the Department and her hard work in the many communities she has served. Limon has a Bachelor’s degree in Business Administration from Whittier College and a Master’s degree in Emergency Services Administration from California State University, Long Beach. In her off-duty time, Limon enjoys spending time with her family, traveling, and attending sporting events. 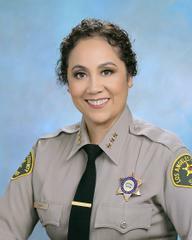 As Assistant Sheriff, Limon will oversee Countywide Operations, which includes Detective Division, Technology & Support, Special Operations Division, and Countywide Services Division, which encompasses over 200 facilities located across the 4,752 square miles of Los Angeles County.